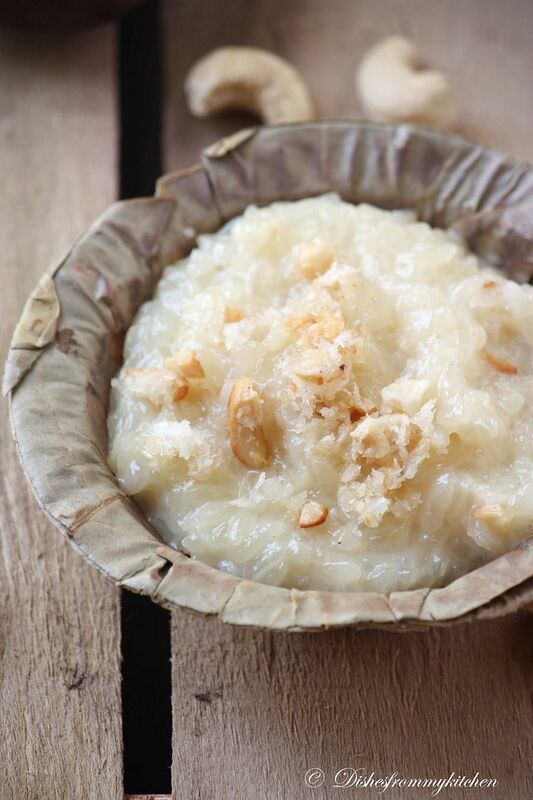 Dishesfrommykitchen: PUTTARISI/PUTARISI SWEET " INDIAN STICKY RICE PUDDING "
PUTTARISI/PUTARISI SWEET " INDIAN STICKY RICE PUDDING "
Puttarisi/putarisi which is called as sticky rice is used throughout Asia. 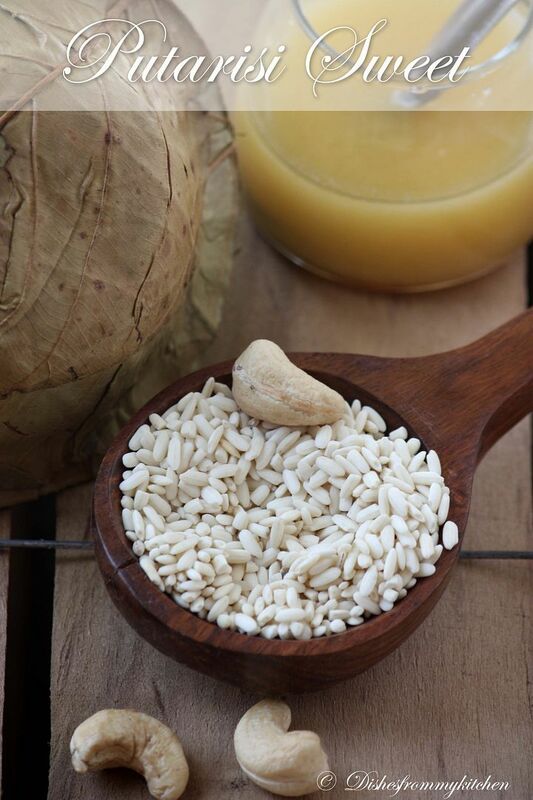 It is also called with different names such as glutinous rice, sweet rice, pearl rice, mochi etc. This kind of rice is sticky when cooked. There are also black and purple varieties. 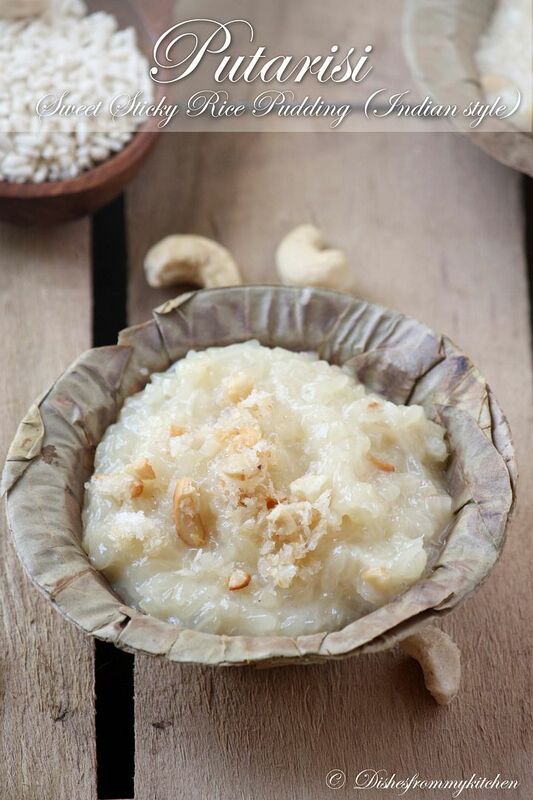 The puttarisi/putarisi sweet which I am posting is our family favorite, being made in our family for a long time by my paternal grand mother and then my mom. This is our family recipe too. We love this a lot for its texture and pleasant fragrance, so no extra flavoring/fragrance like saffron or cardamom is needed. This is so easy to make and unique in taste. Seriously I feel like eating some more when I was drafting this post :) Will also post another recipe with black sticky rice soon..
1. Wash the rice just once with tap water. 3. To the drained rice, add a cup of milk. 4. Pressure cook for 3 to 4 whistles in medium flame. 5. One the pressure is released. 7. Now fry the coconut and cashews in ghee add to the pudding now. Mix everything until well blended. 8. Serve hot with 1/2 tbsp of ghee. 1. Just wash the rice once to retain the pleasant aroma. 2. It tastes so good when served hot. 3. If you don't have pressure cooker you can follow this way. Soak the washed rice in water for 1/2 hr then cook with 1 1/2 milk by stirring once in a while until all the milk is absorbed and the rice is cooked. Once this is done follow the above steps from 6 to 8. Hope you all enjoyed our favorite puttarisi pudding!!! 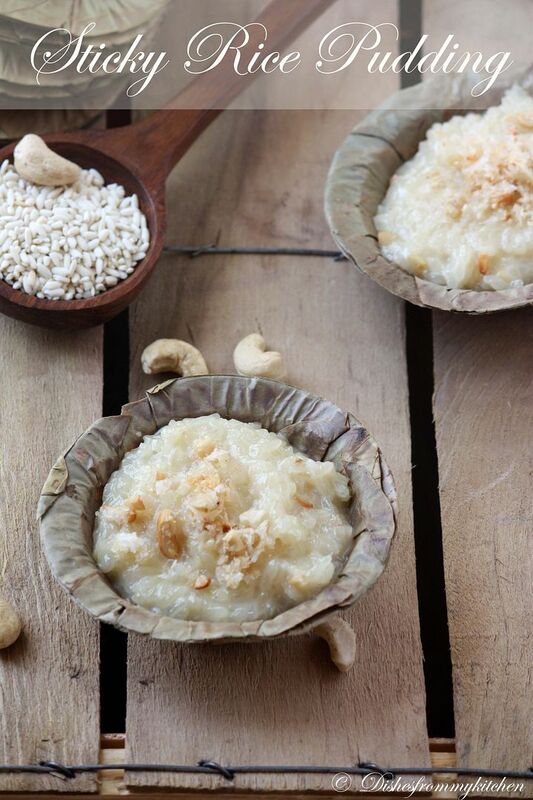 Different style of rice pudding, looks very delicious. Hey that looks great..I hvnt come across this rice variety in here.. This looks so yummy and also new to me and very tempting. looks lovely and mouthwatering...beautiful clicks as usual. Super delicious rice pudding, pass me that bowl,seriously drooling here..
really new to me...but it looks very taste n yummy! A new & creamy sweet dish :) Looks luscious & yummy!!! Delicious pudding,luks yum...too gud presentation. This sounds very new to me and looks so so tempting...craving for some now! Different kind of pudding But it looks so yummy.......amazing presentation. wow, that looks yummy and so tempting. I love thai sticky rice, but didn't know that we have an Indian version too. Where do you get this rice, I have never seen it here in Indian grocery stores in US. Very festive n delicious looking! 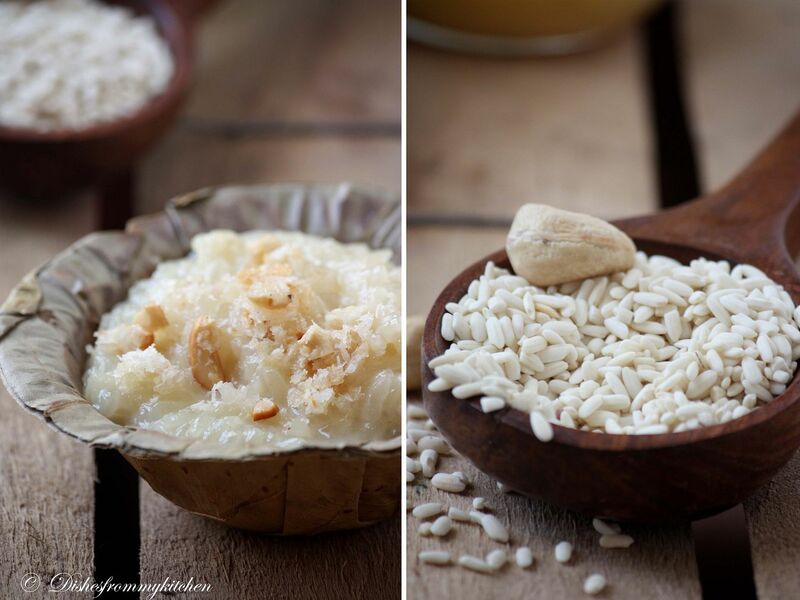 I absolutely love rice pudding but never tried with sticky rice . Looks lovely. Hi, Puttarisi Dessert(rice milk pudding) is a new one and luks Yumm,dense and delicious.Luv ur recipes. its a new dessert for me, looks so delicious. New to me but looks delicious. and yummy. Never used sticky rice before .. new and yummy. superlike..a new dish to me, the pudding looks really tasty. Lovely clicks and presentation. 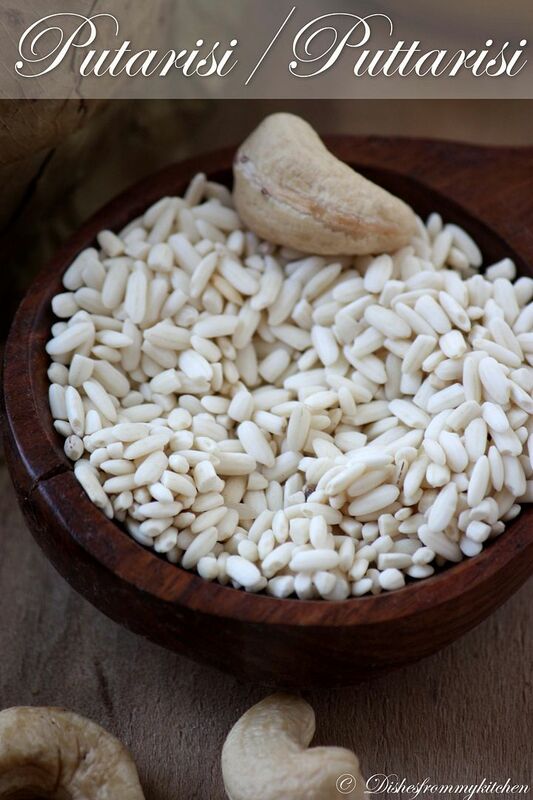 The putarisi looks like murmura ( puffed rice)- is that it? Hi madam, can you please tell me where in Tamilnadu white variety of puttarisi available. I have found black variety in few places but I couldn't find white variety in my search. I appreciate your guidance to find it. Thanks.